Kailua, Hawaii (CNN) - Drama surrounding the fiscal cliff negotiations in Washington lasted well into New Years Day, but a mere 12 hours later President Obama was fully back to his vacation routine 5,000 miles away in Hawaii. Landing at a rainy Hickam Air Force Base in the pre-dawn hours, the president made a quick stop at his vacation house before scooting to the gym at nearby Marine Corps Air Station Kaneohe Bay. 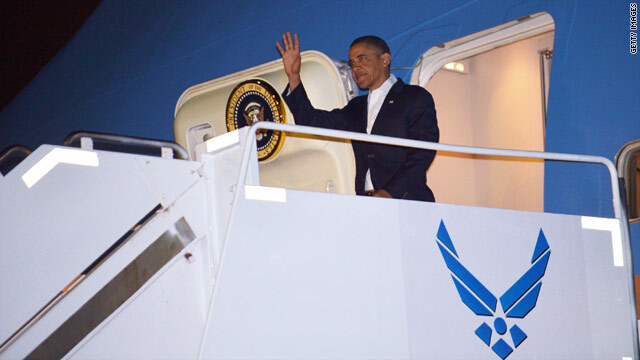 Two hours later, Obama was on the move again, this time for a round of golf – also at the Kaneohe Bay Air Station. His foursome included old Chicago friends Marty Nesbitt and Allison Davis as well as Bobby Titcomb, a childhood friend of Obama from his days growing up in Hawaii. CNN White House correspondent Dan Lothian reports the Obamas will not be vacationing again in Martha's Vineyard this year. He examines the "optics" of presidential vacations especially in an election year. WASHINGTON (CNN) –A senior administration official tells CNN the first family will not be vacationing on Martha’s Vineyard this summer as they have done for the past three years. There had been plenty of speculation about the president’s plans given the potential image clash during an election year, of a vacation at an expensive estate on a posh New England island. Instead of an extended vacation the president is likely to take some long weekends this summer, but where and when is still unclear the official said. 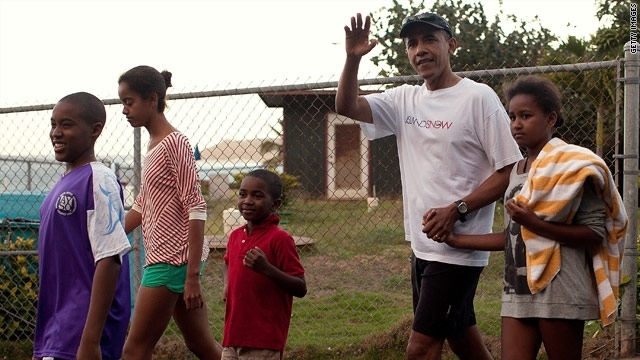 President Obama and his family are spending Christmas on the Hawaiian island of Oahu. According to information provided by the White House the first family opened presents and sang carols before heading to Christmas services at the Marine Corps Base Kaneohe Bay chapel. Later in the day President Obama and the first lady will head back to the base to visit with service members and their families. "On Christmas Eve, the President made phone calls to 10 service members, two from each Service, to wish them a happy holiday and thank them for their service." President Obama and the first family are once again spending their annual holiday vacation on the Hawaiian island of Oahu, Obama's childhood home. 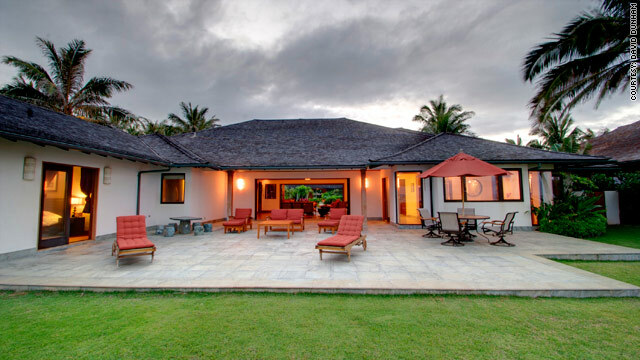 The first family is renting a secluded 5-bedroom house situated on Kailua Beach, according to local realtor David Dunham. The first family has vacationed on Kailua Beach for the past three years. The 6,000 square foot luxury house, has an "Asian flair", according to Dunham. Interior Designer Jay Gorsia designed the house to reflect the Chinese and Indian heritage of the owners. The house is accentuated with Brazilian hardwoods and cherry trim molding, and has a swimming pool set among a lush tropical garden and koi pond. This year's presidential holiday retreat, just a few houses down the street from where the Obama family vacationed in the past, also has a larger swimming pool and a greater level of privacy than houses in years past. A temporary eight foot barrier has been built as an added measure of privacy and security according to Dunham. The Obamas are the first group to ever rent the house. Dunham plans to list the house for sale once the Obama family returns to Washington. The sales price: a cool $7.9 million. VINEYARD HAVEN, MA (CNN) - A senior administration official said President Obama and his top economic advisers are “making progress” in constructing the jobs plan that he’s expected to roll out after Labor Day. The official said it’s still a work in progress, with top aides “crunching numbers” and “weighing options.” “This is something that they will continue working on all next week,” the official said. 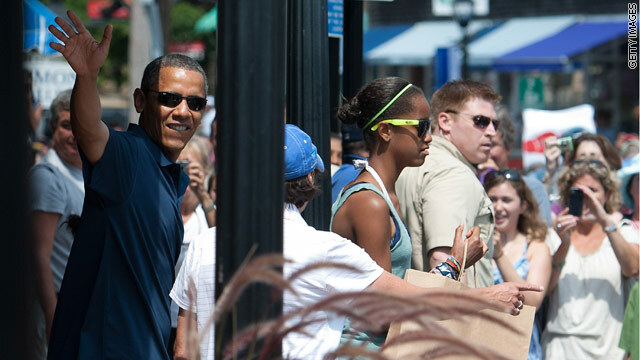 The president is keeping a low profile on Martha’s Vineyard. His mornings consist of economic and national security briefings the official said. His afternoons will closely follow Friday’s routine which consisted of some family time with his daughters at a Vineyard Haven book store, some personal time on the golf course and some one-on-one time with the First Lady.